Diamond Bar – The social event of the year, the Wine Soirée, is fast approaching on Sunday, April 22 to Diamond Bar. Co-chairs Dana Cox, Nancy Lyons, Rick Rogers and Tony Torng announce the spectacular 25th Anniversary Celebration of the Wine Soirée with an afternoon of delicious food tasting from local restaurants, great wine tasting, other beverages, raffle, music, exciting book, silent and live auctions all to benefit the Diamond Bar Library and literacy in our community. For the first time Anheuser Busch in Pomona will be pouring their delicious craft beer, Golden Road. The annual Wine Soirée is an institution in Diamond Bar and is a great way to meet new and old friends and neighbors. Tickets are $65 per person so get your tickets soon as the number is limited. 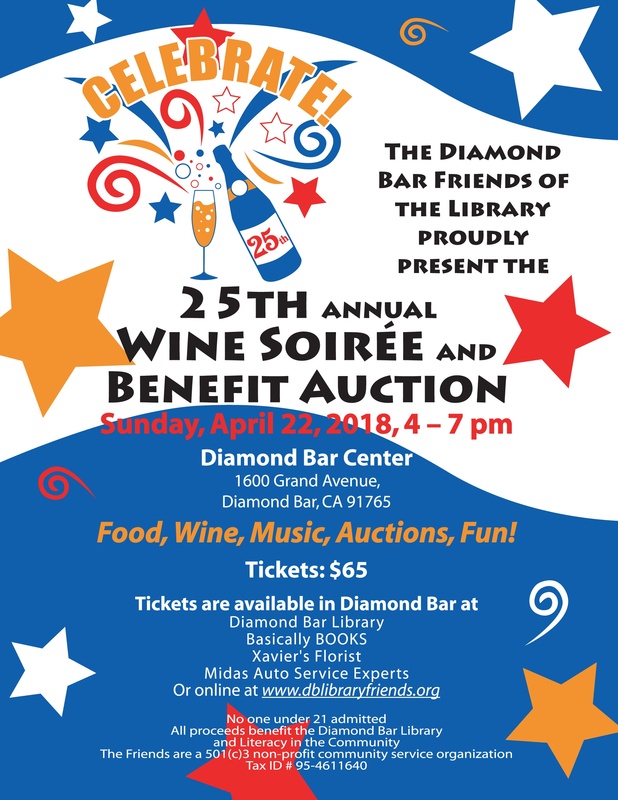 You can purchase tickets online at http://www.dblibraryfriends.org/store/wine-soiree-ticket.html or at the following Diamond Bar locations: Midas Auto Service Experts, 796 N. Diamond Bar Boulevard; Xavier’s Florist, 1135 S. Grand Avenue; Diamond Bar Library, 21800 Copley Drive; Basically BOOKS, 23447 Golden Springs Drive. A unique souvenir wine glass and program are included with each ticket. Each year the Soirée is full of entertaining surprises: There are many spectacular restaurants offering samples of their delicious foods including Albertsons Market, Aljibani Halal Market, Chili’s Grill and Bar, Claro’s Italian Market, Dilliwalla Indian Kitchen, Graber Olive House, It’s A Grind, Jeseca Creations, Julie’s Café, King Bap Korean, Mandarin Taste Restaurant, Mr. G’s Pizza, NiNi Bakery, Old Chendou , Round Table Pizza, Sprout’s Farmers Market, The Side Bar at Oh’Crab, Total Wine and More, and The Whole Enchilada. Visit them is person and thank them for their support for literacy in our community. Those attending this great event can feel good that all the fun they are having – the food and wines they taste, the auction items they win, the music they enjoy – all the proceeds from this will go to improve our quality of life and learning. With the support of the community, the Friends contributed to the Diamond Bar Library over $40,000 in 2017 for much-needed materials, programs, books, magazines, etc. that would not have been possible without the Wine Soirée and our non-profit bookstores, Basically BOOKS. The Friends also sponsored Read Together Diamond Bar 2017, a month-long celebration of literacy last October. We could not do this without the help of the community. Diamond Bar Community Library Manager Pui-Ching Ho announced recently that the Diamond Bar Library is the highest circulation library out of all 87 Los Angeles County libraries. Diamond Bar Library has circulation with 470,000 volumes moving in and out of the library last year. Additionally the Diamond Bar Library ranks sixth in total monthly patronage with a gate count of over 23,000 visitors per month. The Diamond Bar Friends of the Library dedicate our time and energy to supporting this invaluable community institution—so you can see why we need your help!